Igbo leader Chief Rommy Ezeonwuka, the Ogirisi Igbo said what Anambra State Governor Willie Obiano deserves from the people is their support to move the state to the next level, issuing a stern warning to those perceived to be negatively attacking the governor in the media to desist or face the wrath of the gods of the land. He added: “Ogirisi Igbo is capable to invoke the wrath of the gods upon them. Ndigbo should learn how to respect their leaders like their counterparts in the North and South West. What would we as a people gain in blackmailing ourselves? Calling a sitting governor all sorts of unprintable names is bad and will only move us backward. It is time for traditional rulers and religious leaders to rise up to defend the sacredness of Igbo culture and tradition. Enough is enough, we cannot fold our hands and watch political stooges insult and blackmail prominent Igbo leaders like Governor Obiano. As Ogilisi, I will henceforth invoke the wrath of the gods upon anybody who posts negative comments on social media against the governor. 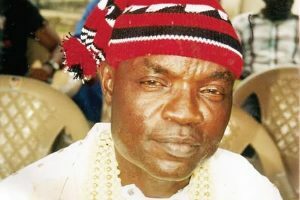 I urge our traditional and religious leaders to use their good offices to fight this ugly trend which is aimed at tearing Igbo apart,” he said. The Igbo leader lauded the developmental strides of Obiano, saying he has made Anambra a state to be emulated by others in areas of infrastructure, security, employment, education and health. “Today the state is rated among the best in Nigeria. A governor who has put in his all to ensure the state is free from crime, the children gets the best of education, that roads are accessible, that workers are paid their salaries as at when due, that pensioners are not neglected, should get nothing but our support. This is the only governor that was able to give befitting burial to all the heroes that died during the Biafra civil war. That exercise alone has made him hero amongst heroes. He must be allowed to complete the good work he started for Ndi-Anambra and move APGA forward. Whether they like it or not, the people are 100 percent behind him and will vote him form a second term in office,” he said.